I’ve been absent for a few weeks (months!). But it’s been for good reason. 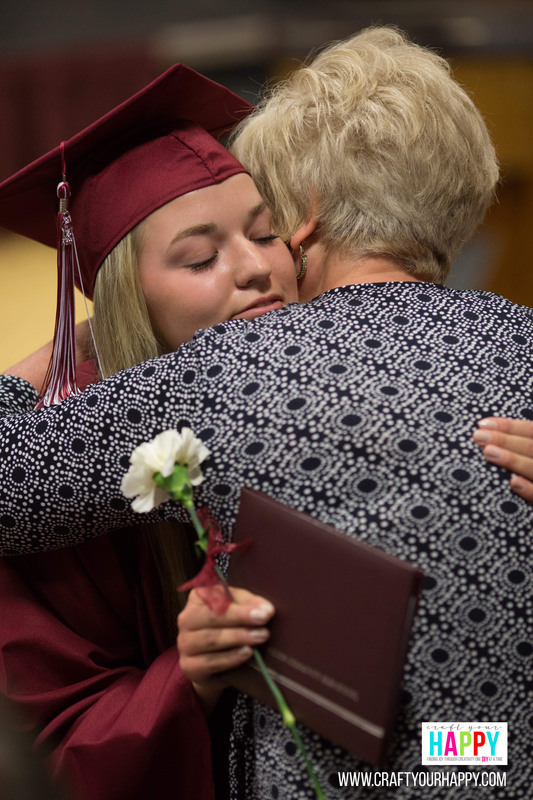 My daughter graduated from high school this past May. Planning her party has taken me away from blogging and designing cut files. It’s okay though. You only graduate from high school once and I wanted to make sure she had a nice graduation party. I’ll warn you ahead of time, this is the longest blog post I have ever done here on the blog. 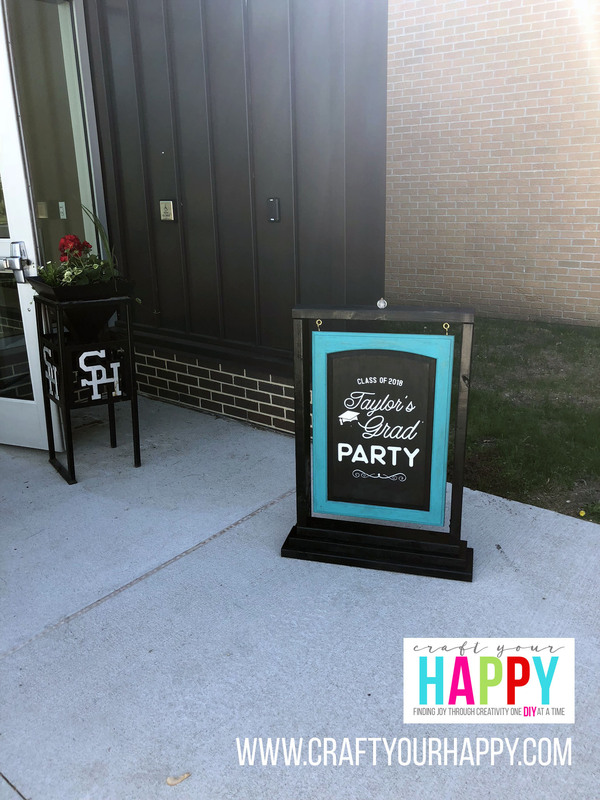 I wanted to show you how we were able to pull off a DIY grad party on a budget. This isn’t the first graduation party I’ve put together. My oldest son graduated three years ago. I can tell you with great certainty that planning a graduation party for a girl is much, much different than planning a party for a boy. Because…Pinterest. And also because boys are just wired differently than girls. We were also just coming off losing my husband and quite honestly, my son’s entire senior year is a bit of a blur. My daughter did not have an extravagant party but she had a nice party. I have to be careful as a single income family to make sure I watch where my pennies go. My goal was to keep the party under $1000. Fortunately, we live in rural Iowa. Extravagant graduation parties are not the norm. 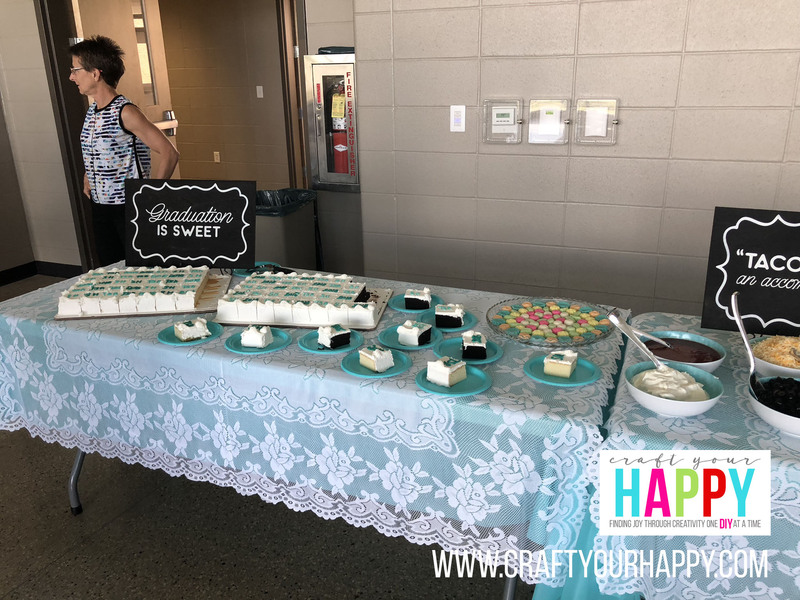 As a whole, our graduation parties are typically held in garages, church basements, machine sheds, and in our case, the school. Our school underwent a huge remodeling project over a year ago and this beautiful atrium facility was added. It makes a great venue for after concert receptions, sports and organization banquets, prom and…graduation parties. It’s new, large and best of all for that particular weekend–air conditioned! (Believe it or not our school JUST got air conditioning this past year!) It was 95 degrees that day. We went straight from a miserable winter that lasted through April to what feels like July in May. We were grateful for the luxury of the AC! This isn’t a great picture and honestly, it was probably taken by mistake. But I’m glad I have it because I forgot to take a picture of the lights. You can see the cool light feature we have in the atrium. These lights can be programmed to match any RGB color you have. If you have the RGB code you want to use, you can program that in there. If you don’t have the code, you can spin a dial until you reach the exact color you want. 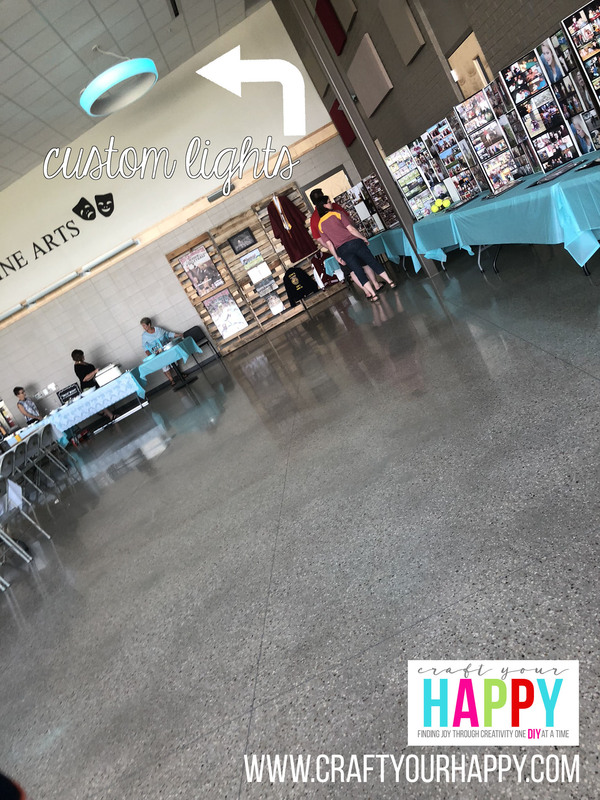 You’ll notice these lights are a perfect shade of turquoise blue to match the decor! At first, I thought they were a little cheesy and at night makes the school look like its hosting a rave, but they did help tie everything together. I guess if I had to describe the decorations, I would say we were going for a rustic feminine look. We had lots of rustic textures, a vintage color palette, a few pieces of galvanized metal, and just enough feminine touches like lace, crystal, and flowers to bring it all together. My daughter and I made all the centerpieces for the tables. We made them from a scrapbook paper pack that I bought when my daughter was a baby. How fitting! (See, it does pay to be a craft hoarder!) Best of all, we made them for about $2 each. Look for a blog post in the coming days that shows you how we made them. Please pay no attention to the horrific condition of the metal chairs. Remember this is a public school and funds are not always plentiful. And since my own funds are not plentiful, I couldn’t afford to rent chairs for the day. So, if you must notice them, just pretend the rust on these chairs is a beautiful patina that just adds to the character and rustic theme! We also made all the little mini wood signs for the tables to put with the paper floral centerpieces. I (of course) designed the cut files we used for the signs. We were able to give these to her girlfriends as graduation gifts after the party was over. I’ll detail the sizes and costs to make them in a later post….and yes, there might be a freebie or two given away in that post. We really liked the burlap table runners you see on all the Pinterest boards. I found some online that were inexpensive in comparison to the kind you find at Hobby Lobby. They were half the price of the Hob Lob at $3.34 a piece, but I would need 6 of them. I know that was only about $20 plus shipping and tax, but I realized we could have a similar look for much less. And, then there’s that whole thing where burlap can be kind of smelly and I didn’t want that. 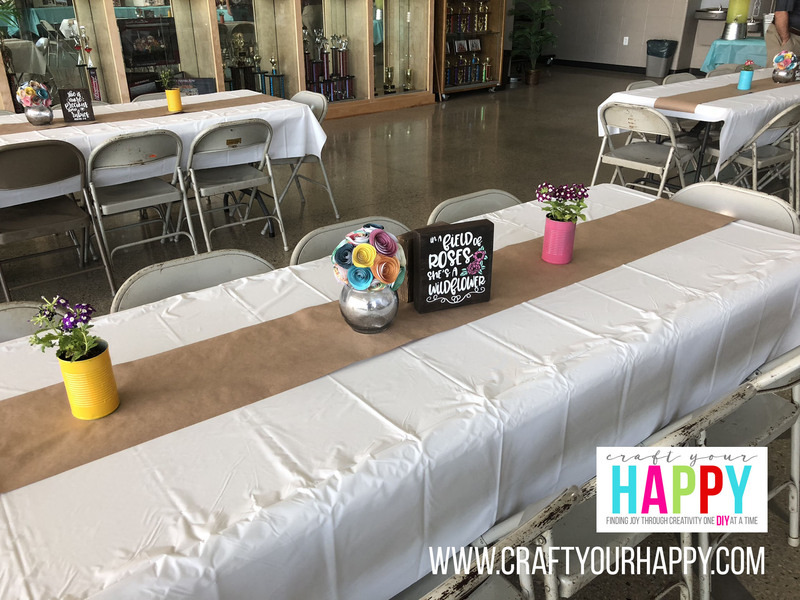 Stay tuned for a quick post on how I created the table runners for less than 35 cents each. Yes, that’s 1/10th of what the burlap runners would cost. In keeping with our rustic feminine theme, we collected cans for a few months, spray painted them and Taylor’s youngest brother planted some pretty, little verbena into each can. I found the verbena plants at Menards in a 6-pack for less than $3.00 a pack. I had some potting soil on hand and had all but two of the spray paint colors in my stash, so the cost of the verbena centerpieces was about 50 cents a can. We were able to put 2 cans on each 8-foot table. They really finished off the tables and added to the vintage look. The week after graduation, my daughter was able to deliver a plant to her teachers and secretarial staff at the school. She told them it was a thank you for helping her grow. I had planned on making cute little plant sticks to put in them with that saying, but I just didn’t find the time. I always have good intentions. We used plastic table covers from the dollar store because they were just going to be thrown away afterward. They were $1.00 each. I used white for the tables where people would eat and turquoise blue for the serving and display tables. Turquoise is my daughter’s favorite color so I was thrilled I could find these, the tableware and napkins at Wal-mart for an extremely reasonable price. The older I get, the less patience I have for Wal-mart, but I was thankful to find the turquoise tableware there. I did buy two lace tablecloths from Amazon to be used on the food table. I wanted something that would set the food table apart from the other tables. The galvanized tray pictured below also came from Wal-mart. They have a nice Better Homes and Garden collection there and I have a DIY project in mind for that tray. But for the grad party purposes, it worked well to hold the napkins and the forks. The wire basket was a clearance item at Hobby Lobby that was originally red, but I gave it a couple of coats of the turquoise spray paint. I do love spray paint! Our menu was pretty simple. At graduation parties around here, you’ll find a lot of pulled pork, ham and turkey sandwiches, a few serving breakfast fare and this year, two even served street tacos from a food truck. I was a little jealous of those parties–yum! Over the course of three weekends, there were about 60 parties. We really didn’t need a four-course meal. It’s better to have something simple and run out than be left with tons of leftovers. People don’t eat at each one of them. Sometimes, they’ll just have something to drink or a piece of cake. You can get pretty burned out on graduation food by the end of May. My daughter is a jock (don’t worry–she takes that as a compliment.) Because of this, we’ve spent a lot of time eating at concession stands and wherever we go they seem to have Walking Tacos. Even after eating all the concession food we’ve eaten over the years, she still really likes Walking Tacos. We decided to serve those and all the fixings. For those of you who may not know what Walking Tacos are…you take a bag of Doritos, cut the side of the bag open to make a pouch, crush the chips, put in a scoop of taco meat and add whatever toppings you’d like and eat it all right out of the bag. They’re meant to be eaten on the run–or walking as the case may be. They’re simple to put together because we used precooked meat from Martin Brothers. Since I work at the school, it was super convenient to order the meat through the food service department. I got 40 lbs of taco meat for about $100. All we had to do was cut each 8 lb. bag open and dump them into an electric roaster and reheat it. Super easy and surprisingly good meat. My family has a membership to Sam’s Club so I was able to buy the shredded lettuce, shredded cheese, sour cream, sliced black olives, jalapenos, salsa and Doritos there. I purchased a cute turquoise colored salad bowl set from Wal-mart–again, the Better Homes and Garden Collection came through for me. They were inexpensive and plastic, so they’ll be put to good use throughout the summer to serve salad. A good friend of mine is from Wisconsin originally, and she told me they serve Walking Tacos in their bars/pubs up there, but they use Fritos corn chips. I couldn’t find Fritos at Sam’s, but I was able to order a case of them from Amazon for only $2 more than what they are at Sam’s. I thought they’d be a nice change from the Doritos that everyone around here is used to. I didn’t have any of the Fritos left at the end of the party, but I did have two cases of Doritos left. I did have about 10 pounds of meat left over so guess what my kids are eating this summer? And can you guess what I’ll bring to the family 4th of July potluck? It’s not a bad thing to have leftovers. My friends and I get together every time there’s a wedding, shower or graduation party to make cream cheese mints for whoever needs them at the time. We look forward to our mint-making parties and like to speculate which events are on the horizon. We just said we would probably have a wedding or two in our near future for which we would be making mints. Wouldn’t you know it? My friend’s son just got engaged. We expect another mint making party in the next year! Normally, we each take a batch and a color and mix them up when we get together on site. 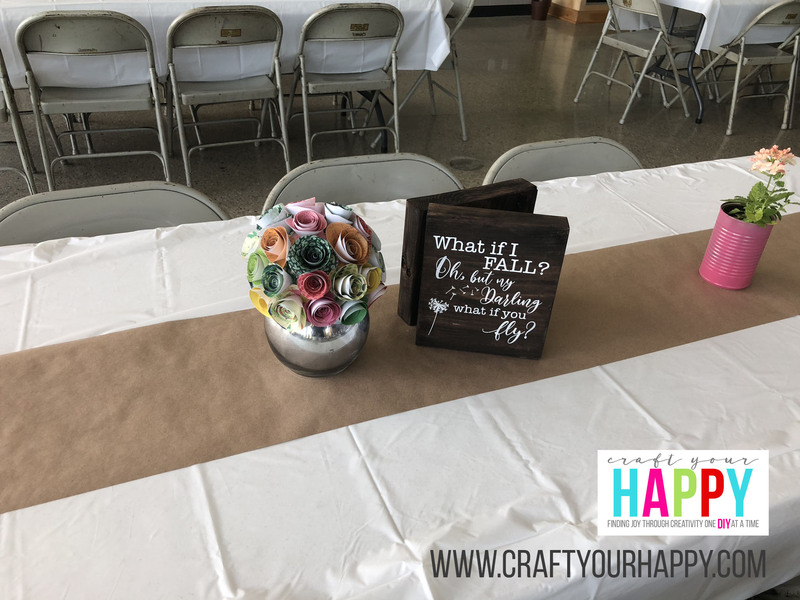 I knew I would have to play around with the colors so I decided I would mix all the batches ahead of time at home with my Kitchenaid mixer and then knead the colors in by hand so I could match the colors in the paper rose centerpieces. This saved us quite a bit of time, though the consistency of the mints was a little different after they had been refrigerated overnight. They were a bit sticky to work with so that just meant we had to roll them in extra sugar so they would pop out of the rubber mint molds. We did a variety of colors and flower shapes for the mints. I picked up two old crystal serving trays at a second-hand store for $3.00 each. What’s funny about these trays is that I’m sure my Grandma, Aunts and even my Mom had these trays once upon a time. They looked like the kind you would get at the grocery store if you had the coupon and a certain dollar amount purchase. They’re heavy and really quite pretty. 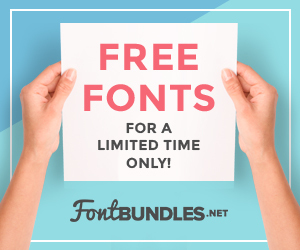 I’m not sure when I’ll use them again, but I’ll find some use for them. If not, I’m not out much. I’ll share the recipe for the cream cheese mints here on the blog in the near future. I ordered the cakes from a local cake bakery. We had just had simple chocolate and vanilla with white buttercream frosting. I hear the cake was fantastic. I wouldn’t know. We ran out and I never even got a piece! I was a little bummed about that because when I opened the box that contained the cake, I could smell the butter in the frosting! Oh well! I’d rather run out of cake than have a whole cake leftover which I’m sure I would have picked at the following week. (I’m a bit of a sugar addict and so are my kids.) The cakes were the most expensive part of the menu and I’m very grateful my Mom picked up the tab for the cakes. If you live in the north central Iowa area, I highly recommend Creative Cakes in Fort Dodge. I do have to note they did just about give my mom a heart attack when she went to pick them up the morning of the party and they couldn’t find my order! Yikes! We would have needed two ambulances because I also would have had a heart attack! I’m sure they were swamped with all the graduation orders. It all worked out and the cake was awesome–or so I’m told. Not that I’m bitter or anything. We served lemonade that was made from the Country Time mix–pretty fancy, right? I put the lemonade in some rustic galvanized metal and glass drink dispensers I had from my son’s graduation party. The lemonade was “dressed up” with fresh raspberries and sliced lemons. It made for a pretty presentation. Graduation is a stressful time, and I may have been running like a chicken with its head cut off and not paying close attention to the directions on the can. I’m pretty sure I doubled the amount of the mix you’re supposed to add to the water. Oops. I froze small containers of the lemonade ahead of time to use as ice cubes so it wouldn’t dilute the lemonade. Turns out I would have been okay using actual ice. 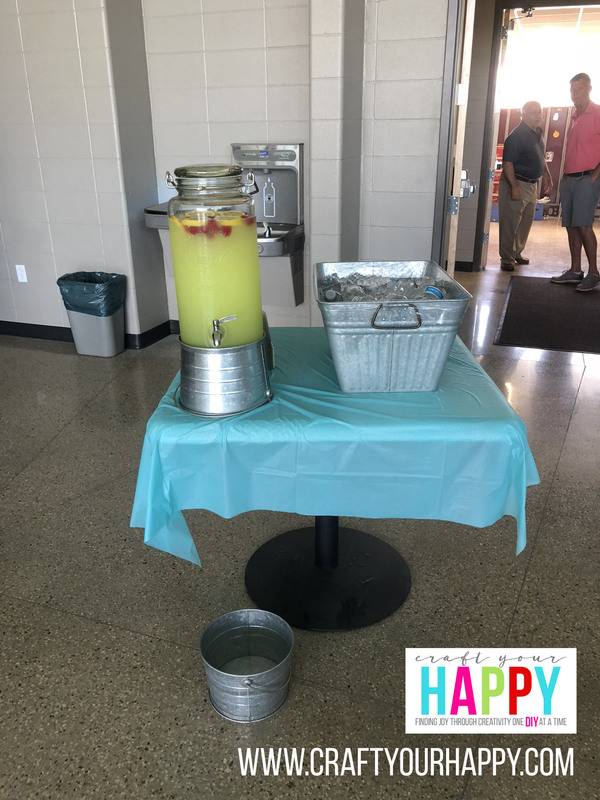 Evidently, it wasn’t too strong and we got lots of compliments on the lemonade. My daughter even got a shout-out on Twitter for best lemonade of the graduation parties. Ha! It’s great when you can make a mistake and no one is the wiser for it. I borrowed the galvanized tub from a friend of mine whose daughter’s party was the week before. I filled it with ice and 4 oz. bottles of water that I also purchased at Sam’s. My total Sam’s Club bill came to $168, but I had a $100 Visa gift card as a rebate from the new tires I purchased for my car. So my bill was $68 at Sam’s, which was awesome for everything I bought! 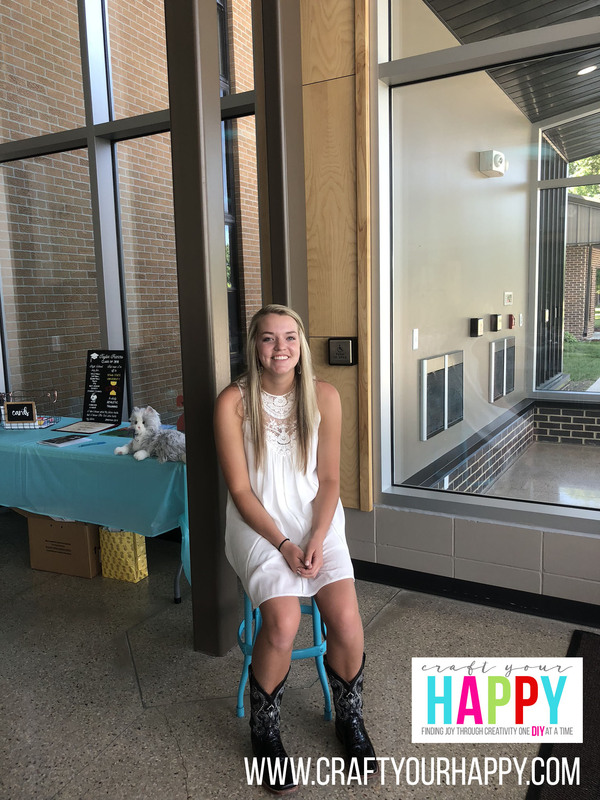 We put together a table for the guest book, cards, gifts and some of the awards Taylor received. I’ve seen those cute chalkboard signs that show the graduate’s name, high school activities, future plans, etc. It was a last-minute decision to make one of those and I was very happy with how it turned out. We spray painted the paper mache 2018 numbers, which we purchased at Hobby Lobby. 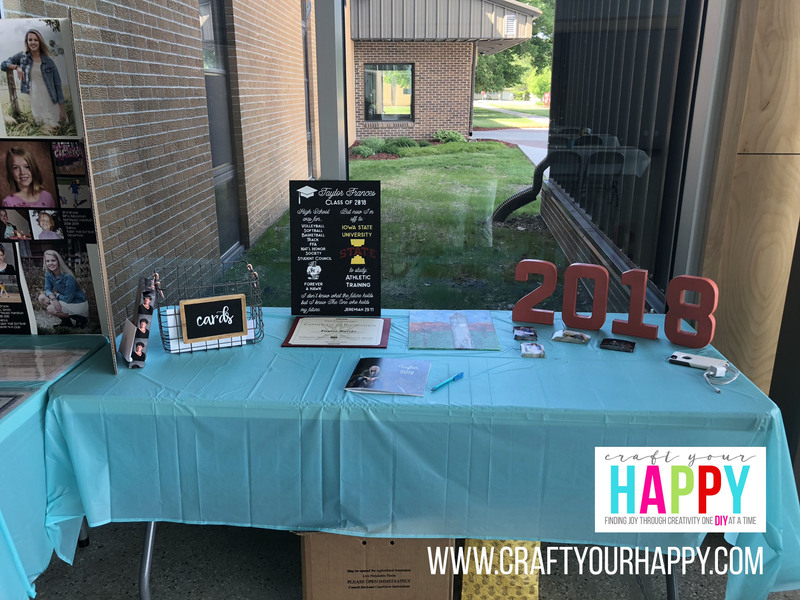 The wire card basket was used for my son’s graduation party and we made a cute little chalkboard sign that said “cards” on it. The most time-consuming part of party prep was organizing all of my daughter’s photos and awards. 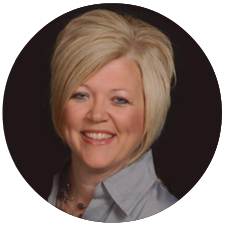 Typically, people will take photos and pin them to display boards or make cute rustic displays out of old windows. While I have a ton of old windows around here for that kind of use, I wanted something more practical. I am that mom who has volumes of pictures–in the digital format. I’m terrible about printing off pictures and putting them in albums. Taylor was born in 2000, so she has her first 4 years of photos printed off and the rest are all digital. So one way or another, they needed to be printed. I assembled the pictures using Photoshop and digital photo collage sheets in the standard 12×12 scrapbook format. 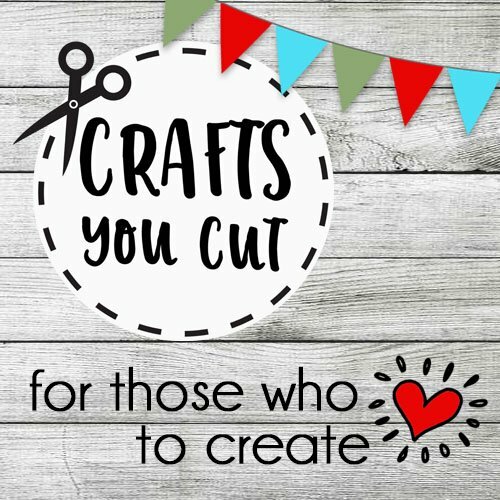 While I could have easily made my own templates, it was just as easy to purchase them from Etsy for less than $10 for several different configurations. I did this for my son’s graduation party, too. I will also do it for my youngest son’s party. Each time, I say I’m going to start early. My youngest is a going to be a sophomore, so I would be better off if I would start them now. I know me, however. I’m a procrastinator. I always say I need the adrenaline kick to get things done. She was involved in more activities than my oldest (he played sports, but also had a job). He had 44 pages that I put together. She had 93!! Girls just tend to take more pictures than boys. This was a pretty expensive part of the party, but unlike disposable tableware, it’s something we can have forever. These are truly a labor of love. I think it probably took me at least an hour and a half for each page. It takes awhile to scan the photos that were film only and tons of time to sort through all the files on the computer to find the pictures and then crop the pictures to fit in the templates. Luckily I have them organized by date taken, but it’s still time-consuming to go through all of them. I also had to go through the photos on her phone and downloaded them to my computer because she had so many pics and Snapchats with her friends. It took me about two months to get the collage sheets completely finished. I have all of my photos printed at Persnickety Prints. 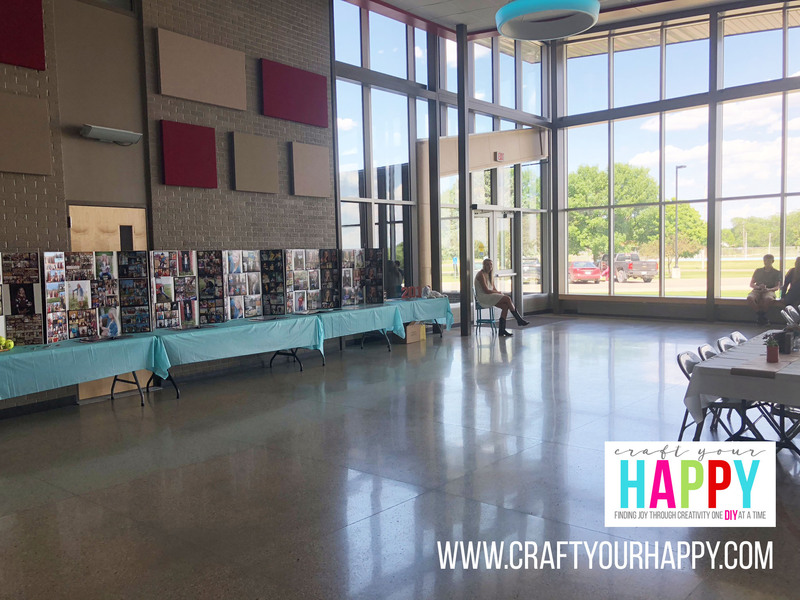 They’re located in Utah and since Utah is the hub of all things related to scrapbooking and genealogy, you know the quality has to be superior. I love the quality and their prices are very affordable. They’re not as cheap as Snapfish, but the finished product is far superior. These are photo studio quality. I had all of my daughter’s senior pictures printed through them and I was extremely pleased with the results. The 12×12 sheets are $1.99 each. If I were to do them on an actual scrapbook page with papers and embellishments, they would have cost me much more! For my son’s graduation, I got into a little bit of a pinch for time and I had some of his sheets printed at Costco. They were the same price as Persnickety Prints and great quality too. So if you have a Costco membership, this is a viable option for you. I used a friend’s membership for ours. I create them as a 12×12 sheet so they will fit into a scrapbook album. This way, my kids have all of their photos printed off and put into albums to look at for years to come. After the graduation party, they belong to them and I can imagine how much fun their kids will have looking at the pictures of their parents some day. I purchased the scrapbooks at Hobby Lobby and was very lucky to find them at 50% off. Now, if you’re not proficient in Photoshop or don’t own it, Persnickety Prints does have a web-based application where you can layout your own photo collage sheets using their tool. 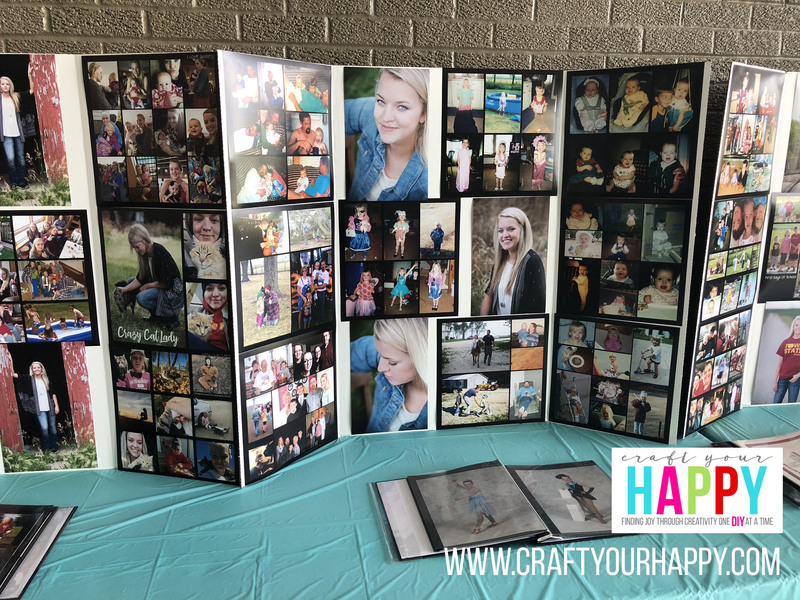 To display them at the party, I purchased the tri-fold display boards at Hobby Lobby. 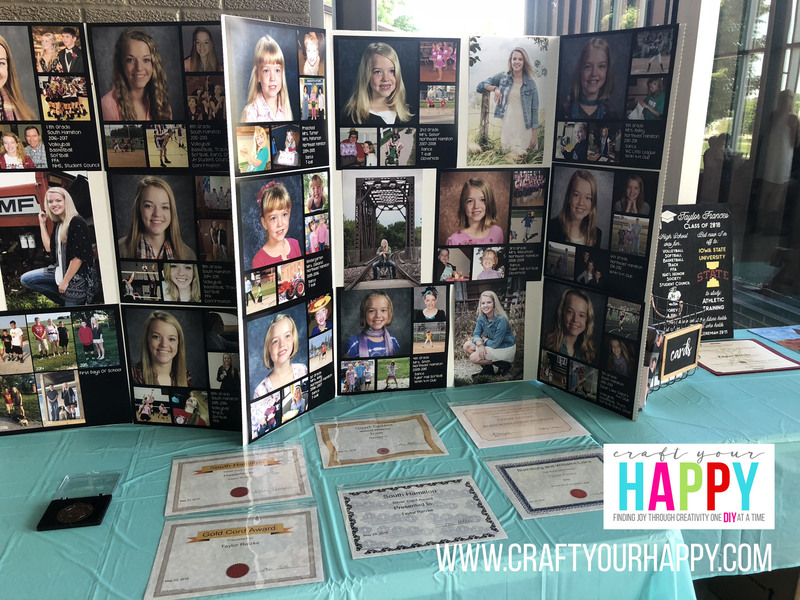 These are the same type of display boards you have probably purchased for your child’s science fair projects or 4-H projects. They are never on sale, so when I thought about it, I would stop and purchase a few at a time and use my 40% off coupon on one of them. Gotta love that Hobby Lobby coupon! This dropped the price from $4.99 to $2.99. I had to buy nine of them. 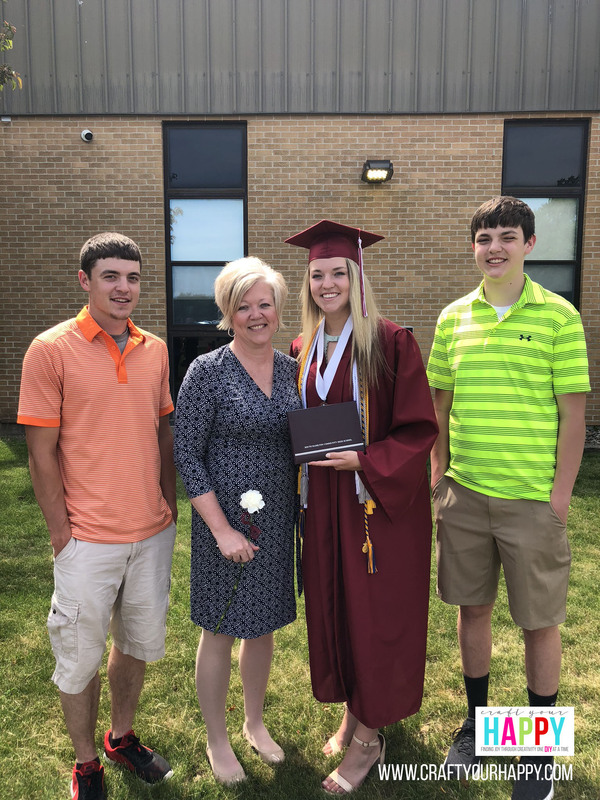 I’ll hang on to them for my youngest son’s graduation party in three years. For my oldest son’s graduation, I used pretty little push pins like you would use to mark locations on maps. They were the perfect length for the boards. The ones I used for him would not match her colors, so I ordered some gold ones from Amazon. Sadly, they were too long and poked out the other side of the board. We decided just to use tape to affix them to the boards. It worked just fine and the tape came off easily when it was time to take the boards apart. After the party, I just folded the boards up and brought them home. I took the pictures off a few days after graduation and put them directly into the albums. It did make for a striking display. And I love that my daughter (and sons!) have an album full of memories to keep. We came upon the pallet display by accident. I knew we wanted something where we could hang her posters, FFA and letter winner jackets, etc. I was drawing up plans to make a trifold backdrop. My thought was that I could them for a way of displaying signs should I decide to create signs as a business or as a backdrop when making videos for the blog. 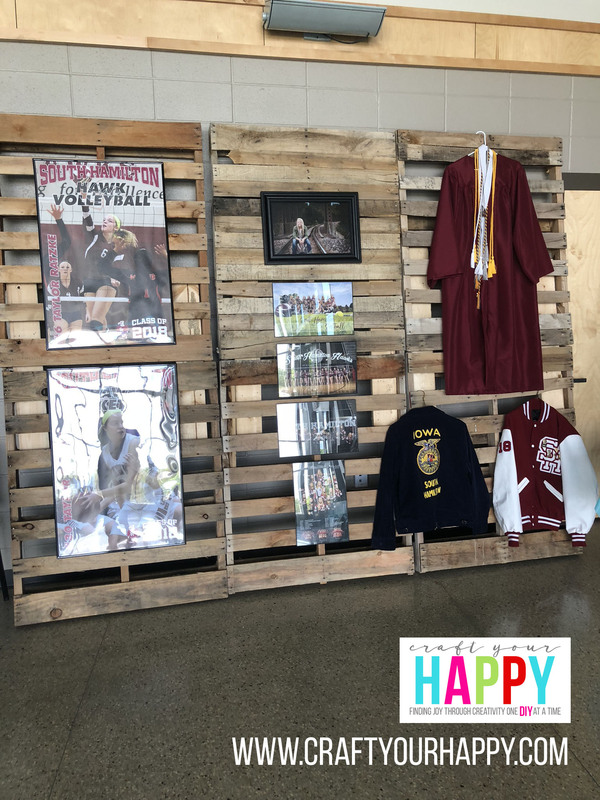 Lucky for us, the kids put this pallet display together for the FFA banquet held a few weeks before graduation. I asked Taylor’s advisor if he could keep it long enough for her to use for her graduation reception and he graciously said yes to that request. 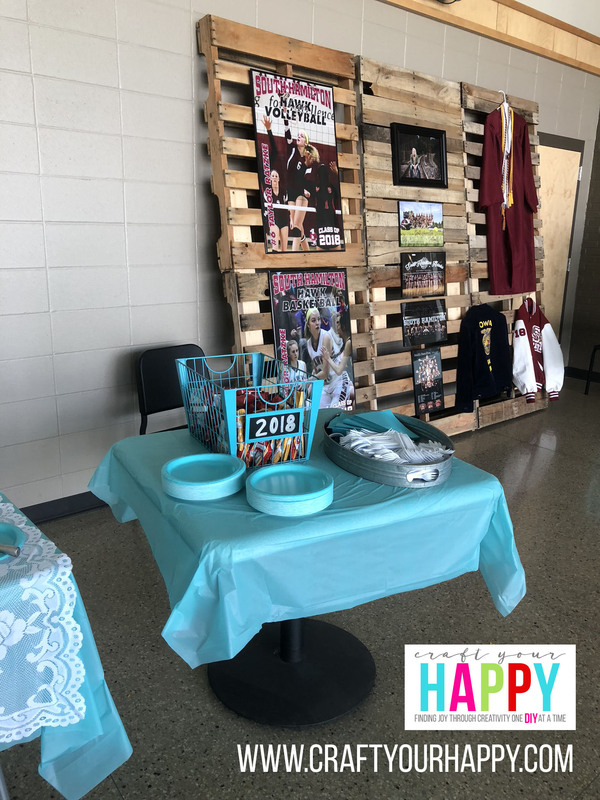 Since we had her party at the school and the vocational ag classroom is just down the hall, it was easy to get it and put it up. It made for a great place to display her sports posters. It was a perfect place to hang her FFA and letter winner jackets and there was enough room to display her graduation robe with her honor cords and National Honor Society medal. The glare from the windows was bad and I didn’t get a great shot of the display but you get the idea. It took us about 3 hours to set up everything with just my Mom, Taylor and I working on that. I didn’t get to take all the pictures I wanted to or as detailed as I wanted to before the guests started to arrive! We had about 250 friends and family come through the door to help celebrate Taylor’s achievements. She was thrilled with the number of people who came. I tried to get to everyone who came so I could visit with them a little bit but at times the number of people who came made it impossible to do so. By the end of the day, my voice was shot and I realized how out of shape I am since I stood the four hours of the party when I’m used to sitting on my rear end most of the day. 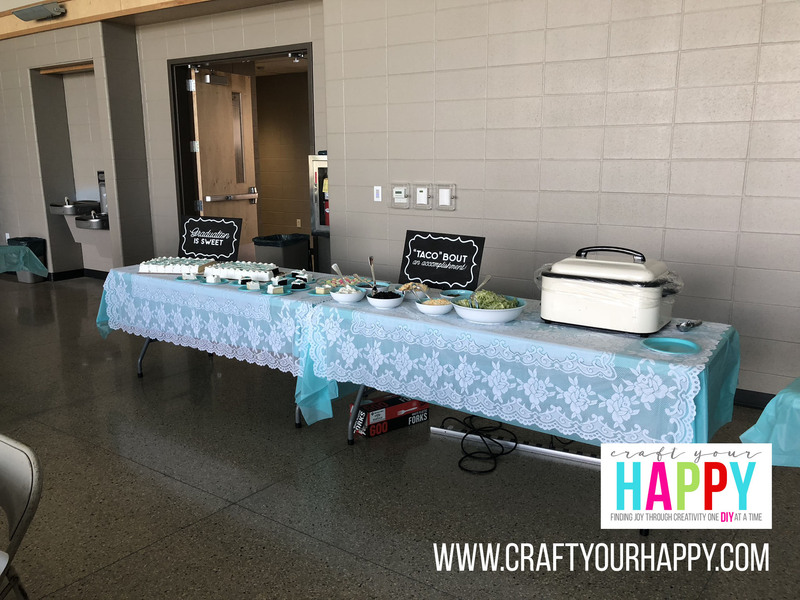 We got lots of compliments on the party–especially the table decorations and the photo displays. Those kind words and the smile on my daughter’s face was well worth any pain I felt! I should mention that metal stool Taylor is sitting on was a curbside find from a few years back. It was an ugly bright yellow and she gave it a quick couple of coats of turquoise paint. She wanted something cute to sit on in between people coming. We had a steady stream of visitors so she didn’t sit on it as much as she thought she would. I’m forever grateful to everyone who came to help her celebrate and I’m especially grateful for the help from my friends and their husbands and my son Jake and his girlfriend, Jenn. They took over and kept everything humming by keeping the food table well supplied. We couldn’t have done it without any of them! So how did we do with our budget? My goal was to keep it under $1000 and we were able to do that with some help from a gift card rebate and Grandma. I thought maybe the pictures would be the most expensive part of the expenditures, but it turns out it was the invitations, thank you notes and postage. We even did postcards for the thank-yous in an effort to save some money on both the cards and the postage since we could use postcard rates. I probably didn’t need to do 93 sheets of photo collages for my daughter, but it’s nice to have all of her years documented. I considered them to be part of her graduation gift. For the most part, I think we did well with our grad party on a budget. And the memories we created that weekend were priceless.